With a new and warmer season around the corner, we need to refresh our looks. Each season, the makeup artists for the fashion shows inspire us to make a change in our daily beauty routine. Its time to ditch the darker shades, change heavy creams with lighter versions and take extra care of your hair. Read on for the best tips recommended for bronzing, contouring, frizz control and hiding dark circles. 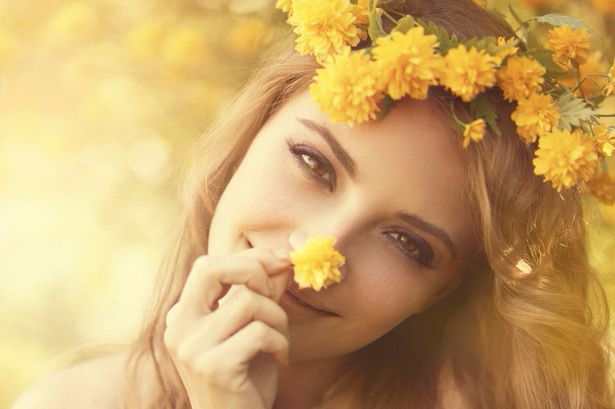 Check our Spring beauty tips below! How to get your Skin, Hair and Makeup ready for spring? Switch your dark lip color for a brighter shade. Nothing enlightens your face more than a bright lipstick. Coral shades are awesome for spring. Many of us forget applying sunscreen during winters, but it is a must for spring. Incorporate sunscreen in your daily routine as you are going to spend a lot of time outdoors. BB and CC creams with SPF are great when you are in a hurry. Ditch the heavy foundation and instead opt for a tinted moisturizer. The light dewy texture of the moisturizer will look natural. Try to look for one with SPF. Switch your darker blush shades (rose or bronze) and instead opt for brighter shades like coral. Swap your powder blush and highlighter for a cream version to give some life back to your face. Add a facial cleansing routine to get rid of the dead cells, repair your skin and prep it for spring. Exfoliation is extremely important, however try to avoid scrubs with strong formulas. Add vitamins to your diet. They help in enhancing your beauty from within. Add Vitamin B3 to take care of redness of skin, Vitamin C for blemishes and Vitamin E to give back the lost moisture. Hiding your hair under scarves all winter? Get a new haircut and fresh highlights to welcome the brighter season. Big full brows are a big trend this season. Try more on emphasizing the natural shape of your brows instead of overly filling them up. Keep your makeup natural and light with light coverage foundation and pink or coral blush. Use colored eyeliner on your lower lash line for a pop of color. It is a subtle and trendy way to sport beautiful shades. Glowing cheeks remind of the freshness of spring. Opt for a pink blush to play up the natural rosy cheeks. Apply a hydrating body lotion daily for a smoother and healthy looking skin. Welcome spring with a fresh floral fragrance. Gift yourself a perfume from our collection of 10 new fragrances for spring.